On Sunday morning, my husband turned to me and said "this coffee is good." I agreed and said I actually have no idea how much it costs though. Cost is generally a factor on whether I would actually buy coffee and when I looked up to see that the Rombouts Laos single origin ground coffee was only 50p more expensive than my usual coffee brand I was pleasantly surprised. Rombouts are a family company that were established in 1869 when Frans Rombouts rented a roasting cylinder and began roasting coffee in Antwerp. I was pleased to read that each year, Rombouts is increasing its commitment to Fair Trade in order to support the quality of life of small producers through its Max Havelaar label product line. 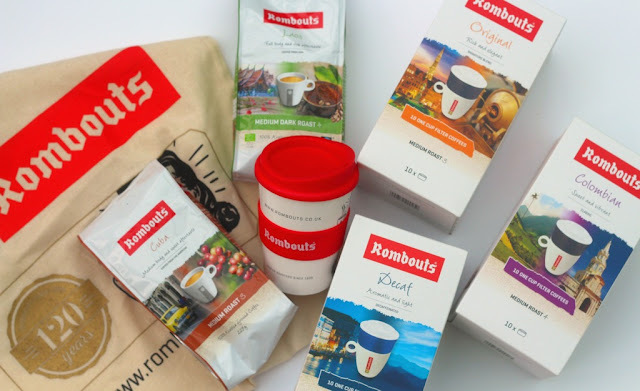 Rombouts sent me a variety of products from their ground and one cup range to try. They also sell pods if you have one of those machines. I have to say I have enjoyed all of them. I really liked was the one cup filters and they were not a product I would have usually bought. I am a total coffee snob and will not drink instant. Infact if I go round someones house and know they would serve me instant I will ask for tea. Obviously, it is not always easy to have ground coffee though. For instance when I used to work as a teacher, I would drink tea as the staff room wasn't really equipped with much more than a kettle. These filters would have been perfect. You just give the filter a little shake, pour in the hot water and wait for the coffee to drip through. I am thinking it would also be great to have if you travel. Most hotels only have instant, and they would also be great for self catering holidays. The Italian style one cup filters. Ooph the kenyan pure. Some great looking choices there. Will try the Colombian expresso. Absolutely addicted to espresso!..happy easter! I'd like to try the Italian style ground coffee. The Italian Style coffee pods would be great - have just got a machine! The Italian Style Ground Coffee.